When we arrived at the RV resort, Bev’s brother, showed us the improvements that he had made in his park model mobile home since we had last been here. He had the whole place painted, new flooring, new hardware on the kitchen cupboards, and a new faucet on the kitchen sink. He said that a new stainless steel sink would look good in his kitchen. Well, a few days later we were taking the trash to the bin, and lo and behold there was a cabinet sitting beside the bin with a stainless steel sink in it. We promptly salvaged the sink and put it in his storage shed. About a week later we cleaned the sink up, removed his old harvest gold sink, changed the faucet out for the new one, and hooked up the drain. It looked good, and it didn’t leak! In about half a day, something that was on the trash heap was restored and purposeful once again. We’ve been learning to live in a 26′ trailer together, and fortunately it’s easier because most days the the weather is sunny and warm in Yuma. It’s nice being in warm weather for the winter! One of the problems with the trailer is that the owner has replaced the dining space with two recliners (only one of you can recline at a time). This creates a problem at mealtime especially if you have company, which we do most evenings (Bev’s brother); so we eat out on the patio usually about sunset. It is the same time that the hummingbirds come to the feeder to get their last meal before roosting for the night. I’m always intrigued to watch them because it is a different scenario each evening. Sometimes four or five of them can share the feeder peacefully; and sometimes one of them thinks that it’s his job to keep other birds away from the feeder … to protect its resources that he didn’t provide (I did!). Interestingly, he probably used most of the energy that he gained from his feeding in doing that and kept other birds from receiving the nourishment for the night that I wanted them to have. I have mixed feelings today as I am saddened to hear about the passing of a long time friend and colleague, Dr. Brian Moore. He helped me navigate some very difficult times in my life shortly after coming to South Bend. He was best man at our wedding, and he has been a friend and source of counsel throughout my years as a pastor. As we both neared retirement, I was looking forward to being able to spend some time with him roaming those Maryland hills and battlefields that he often talked about. Unfortunately, we won’t be able to do that; but in his books and Facebook posts, he reminded us that physical death is not the last word, and that those who follow Jesus will one day be reunited. Even though ALS is a devastating disease and robs a person one day at a time of his/her physical abilities, it did not dampen Brian’s spirit and his desire to tell others about Jesus’ love. Well done! We’ll miss you until we meet again, and you can show us some of your great discoveries in Heaven! Our love and prayers go with Amanda and the rest of the family. One of the ways to get your exercise in an RV park is to walk through the park and see what new rigs pulled into the park in the past day. It’s amazing the difference in rigs! One evening while were walking I noticed a large toy-hauling fifth wheel with a couple of slide- outs pulled by a White Frieghtliner diesel truck. 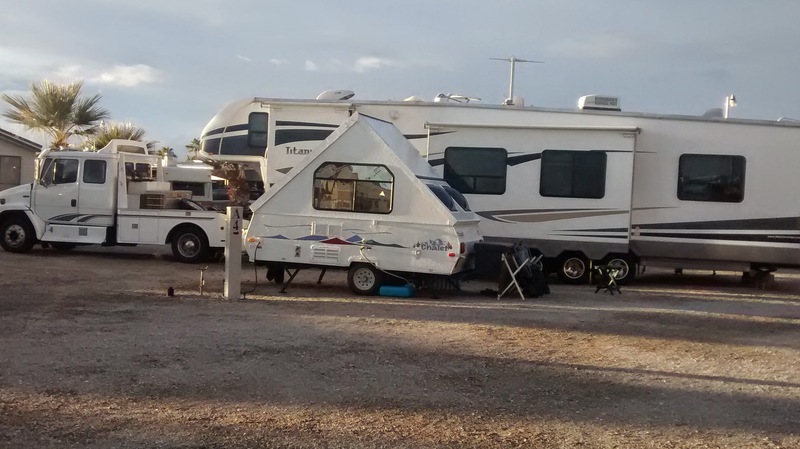 In the days since, I’ve notice a small car that I think fits into the back of the fifth wheel! We’re talking one big rig here! A couple of days after noticing this big rig, we walked by, and this is what I saw sitting next to it … It’s a little popup trailer called a “Chalet” that can be towed by almost any vehicle on the road. I guess each person has to ask himself or herself, “How Much Is Enough?” as we journey through this life. It probably has to something to do with our current mission in life. 12 I know what it is to be in need, and I know what it is to have plenty. I have learned the secret of being content in any and every situation, whether well fed or hungry, whether living in plenty or in want. 13 I can do everything through him who gives me strength. For months I have been complaining that I didn’t have any jeans that I liked to wear; so I kept wearing the same threadbare jeans. They were comfortable; but the more that I wore them the worse they looked. Fortunately, they’re in fashion with some crowds. One pair I wore only for yard work, and Bev warned me that one day I was going to out in the yard, and they were just going to fall apart. I’d embarrass myself and the neighbors! As I was getting ready for our trip south, I was going through my closet and found two pair of jeans that I had purchased sometime in the past… probably at an outlet store at the end of a season. They were brand new! I had just stuck them in the closet and promptly forgot about them … probably pulled out my corduroys for last winter. Who knows? Praise be to the God and Father of our Lord Jesus Christ, who has blessed us in the heavenly realms with every spiritual blessing in Christ. (Ephesians 1:3 – NIV). I’ll stop with verse 10; but you can go on to read more of the blessings that God has already placed in your spiritual inheritance if you’re a follower of Jesus. Perhaps it’s time we start using what God has already provided in Jesus and complain less about how we wish things were. Well, it’s the first Sunday that I sat in a congregation without some “upfront” duty. (We were traveling last week.) In fact, I sat in two congregations … one was at the RV Park where we are staying, and one was at the church my brother-in-law attends and actively participates. One group consisted mainly of refugees from the cold weather (many from Canada), but wanted celebrate the fellowship we have together in Jesus. It appeared to be a mixture of people from differing denominations and lay led. Our neighbor from Canada led the singing, provided the devotional thoughts, and with his wife and the pianist provided special music. You could tell that he loved Jesus. (They were some of the first people we met in the park and invited us to come to the service.) Someone else shared the Communion preparation which came from a congregation in Alaska, and we shared the elements together. I was moved by the authentic worship and fellowship. Others were moved to ask Bev to sing a special some Sunday. (They even complimented me on my singing.) We were about 50-60 in attendance. The other service was with people in a local congregation. We have attended this congregation when visiting here in the past. It was good to see new faces as well as ones that we have known for several years. It was good to see them continuing to walk with the Lord. The Pastor had a good Biblical message and challenge to the congregation which will be 50 years old this year. We look forward to sharing with these congregations as well as others in the next few weeks.